This weekend is the 40th anniversary of the Apollo 11 mission, when man first set foot on the moon, but Buzz Aldrin just tipped us off to another of his many accomplishments: He took the world's first space selfie back in 1966. Eat your heart out, Instagram. 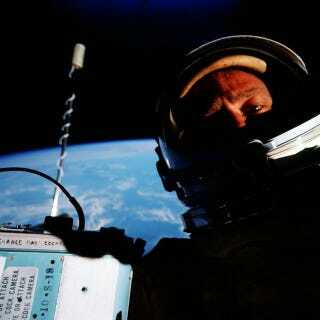 The photo Col. Aldrin refers to was snapped on an extra-vehicular activity during the Gemini 12 mission in November 1966. A professor at Northwestern University had arranged for the astronauts to take ultraviolet photos of the stars, using a camera mounted to the outside of the spacecraft. The experimental photos would be taken during darkness, but when the shuttle passed into daylight, Col. Aldrin couldn't help snapping a picture of himself with the earth behind him.